Plastic poles with a metal base. The metal base is in four sections, all interchangeable, pivoting supports, using ordinary 6" nails to connect and fasten to the ground. The total length of the weave poles is 6.0m with 1.0m poles at 0.5m intervals. The A Ramp is made with phenol ply on a steel frame, painted with enamel paint and grit surface. The ramps are hinged at the top with removeable 19mm pins, so that it can easily be carried and stored. The supporting bars are attached with large hand turned wing nuts and have various positions for standard/mini dogs. The length of the ramps are 2.7m and 0.92 wide, with slats at 0.3m intervals. All steelwork has a metal-etching primer applied before the enamel is applied. The collapsible tunnel is made on a folding frame of inverted 'U' uprights hinged on the base, with a locking bar at the top. The canvas tube is attached with velcro so that it can be easily removed for cleaning. Length of the rigid section is 0.9m and 0.6m high, with 3.0m collapse section. Ordinary 6" nails are used to fasten in ground position. All steelwork has a metal-etching primer applied before the enamel is applied. The rigid tunnel is a wire frame heavy duty PVC tunnel of 5.0m length and 0.6m diameter. It is held in place with two end supports and has hooks along the length to secure any desired shape. Ordinary 6" nails are used to fasten in ground position. All steelwork has a metal-etching primer applied before the enamel is applied. 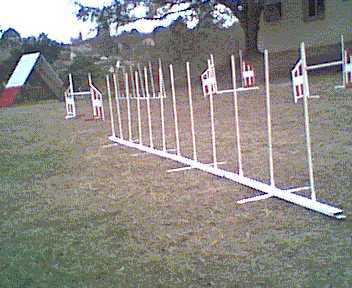 The Dog Walk is made up of six sections of 2.1m length each, giving a ground length of 12.0m. The height of the walk is 1.4m Each section is on an angle iron frame, phenol ply board with enamel paint and grit surface. The uprights have removeable supports at the base. The entire structure is held together with five locking pins of 19mm diameter. All steelwork has a metal-etching primer applied before the enamel is applied. The Tyre jump is made with a minimum 19" tyre, suspended by chains within a steel tube frame. The frame is quickly adjusted for mini dogs by a two position design on the base sections.Ordinary 6" nails are used to fasten in ground position. All steelwork has a metal-etching primer applied before the enamel is applied. The table has a matted surface on a phenol ply board, 1.0m x 1.0m with foldaway legs that are also adjustable for height. Ordinary 6" nails are used to fasten in ground position. All steelwork has a metal-etching primer applied before the enamel is applied. 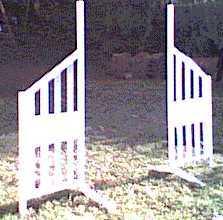 Two types of hurdles are offered. On the left is an all welded tube frame with plasma cut wing inserts. This is available in red and white enamel paint finish. On the right is a budget version that has welded upright, with plasma cut and folded sheet metal wing section. This version is available in white enamel finish only. All steelwork has a metal-etching primer applied before the enamel is applied. 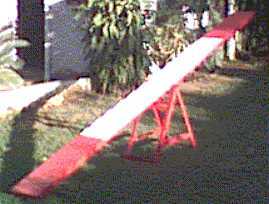 The See Saw has two sections of 2.1m phenol ply boards, painted with red and white enamel and grit surface, on steel frames. One side is weighted to always return to the down position. The boards are easily attached to the centre pivot section, 0.7m high, with locating pins and wing nuts. All steelwork has a metal-etching primer applied before the enamel is applied. 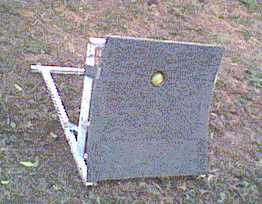 The Flyball machine is a single ball front loading type. The frame is made of steel tube and the curved front is phenol ply covered with mat. The rear portion of the base is easily detached to allow for compact storage. Ordinary 6" nails are used to secure in ground position. All steelwork has a metal-etching primer applied before the enamel is applied. 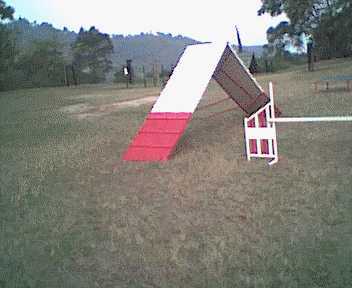 All above equipment made with 25mm square tube, angle iron, galvanised sheet metal, exterior quality plywood and painted (metal parts with etch primer base) in red and white enamel paint (ex budget hurdles that are white only). As far as possible, the equipment is designed to be easily separated in order to minimise storage space, without sacrificing durability and strength. All the above prices are inclusive of VAT and are FOR Durban.ie exclusive of cartage charges. Terms of payment are : 30% with order and balance cash on delivery. These are the main items that not every club can have readily made. There are smaller items such as number plates, cross bars etc that can be quoted for on application.